923. uttAraNaH - He Who lifts up. `ut' is an upasarga, meaning `intensity'. `tAraNa' is derived from the root tR - plavana santaraNayoH - to cross over, to swim. uttArayati iti uttAraNaH - He Who helps in crossing over, is uttAraNaH. SrI BhaTTar continues the interpretation in terms of the gajendra episode - the nAma refers to bhagavAn lifting up the elephant and the crocodile both from the waters - tau sarasaH uttAritavAn. It is to be noted that SrI BhaTTar uses the word "tau' - He lifted both of them from the lake. In a sense, bhagavAn protected both the elephant and the crocodile - by relieving gajendra from the clutches of the crocodile, and by relieving the crocodile from its curse. SrI baladeva vidyA bhUshaN gives the same interpretation also - sarovarAt gajendram uttArayAmAsa iti uttAraNaH. Most other interpreters interpret the nAma as a reference to bhagavAn lifting the samsAri-s from the ocean of samsAra. SrI Sa'nkara's interpretation is: samsAra sAgarAt uttArayati iti uttAraNah. SrI cinmayAnanda explains the nAma as: "One Who lifts us out of the ocean-of-change. By identifying through our body-mind- intellect with the changing whirls of matter around us, we assume to ourselves the changes which provide us the horrible sorrow of mortal finitude. On lifting ourselves from the giddy changes in these whirls of finite matter, when we fix it upon Him, the one Consciousness that illumines all changes in all living creatures, we get uplifted into a state of Immortality - changeless, blissful, supremely satisfying. Hence SrI nArAyaNa is called the Up-lifter, the Savior". He Who, like a person rowing a boat to help cross a river, helps the samsAri who is tortured by the heat of samsAra, and who surrenders to bhagavAn seeking help in crossing over the ocean of samsAra. SrI satya sandha tIrtha explains the nAma in terms of the praNava mantra that lifts up the spirits of the sanyAsin-s etc. - utkRshTaH tAraH praNavo yeshAm ta uttArAHsannyAsinaH teshAm NaH sukham yasmAt sa uttAraNaH. a) He Who slays the evil-doers. b) He Who destroys the sins of those who surrender to Him. a) dushkRtinam hanti iti dushkRti-hA _ He Who destroys the evil-doers is dushkRti-hA. - sthalastham dArayAmAsa grAham cakreNa mAdhavaH - mAdhava slew the crocodile with His discuss when the crocodile was on the land. "I take incarnations in every yuga, for the protection of the good, the destruction of the evil, and the establishment of dharma". dushkRtim grAham hatavAn iti dushhkRti-hA - He Who destroyed the crocodile that committed apacAram towards a bhAgavata. - ANDAL sings this guNa of bhagavAn in tiruppAvai: pollA arakkanaik kiLLik kaLaindAnai - He Who got rid of the ferocious demon as if by weeding him out. - vEzham mUvAmai nalgi mudalai tuNittAn (periya tirumozhi 6.8.3) - BhagavAn came on garuDa who is the incarnation of the veda- s, destroyed the crocodile and removed the pain and suffering of gajendra. SrI veLukkuDi kRshNan explains that for bhagavAn, the worst among those who are sinners are those who commit apacAram to His devotees. This is what makes Him angry the most, and this is where His guNa of dushkRti-hA is in full force. We see this in His incarnations as Lord rAma and Lord nRsimha. Lord ra'nganAtha also displayed His anger when the priest committed apacAram against tiruppANAzhvAr. This nAma should remind us that bhAgavata apacAram is the worst of all sins, and should be avoided at all costs. He Who destroys the sins, or alternatively, "ye pApakAriNaH tAn hanti it vA" - He Who destroys those who commit sinful deeds. SrI rAdhAkRshNa SAstri reminds us that it is not just bhagavAn who redeems us from our sins, but His nAma is just as effective. In helping draupadi against act of duryodhana, Lord kRshNa assured rukmiNi that before He could go and help draupadi, His nAma already protected her when she cried out His name when in need of help. In addition to getting rid of those extreme sinners who cannot be corrected any other way, bhagavAn is also the One Who corrects and redirects those who are inadvertent sinners. SrI cinmayAnanda's anubhavam is that when bad actions (dush-kRti-s) are undertaken by anyone, prompted by sensuous desires, they leave impressions (vAsanA-s), and these always have a tendency to make them repeat similar actions. When one turns the mind towards nArAyaNa, the Self, one is emptied of these existing vAsanA-s, and so the Lord is indicated as the "Destroyer of the sins". "One Who destroys the sin of the prapanna-s - those who have sought refuge under Him. 925. puNyaH - The Purifier. Please refer to the write-up for this nAma in Slokam 73 (nAma 692). 926. dus_svapna-nASanaH - The Remover of evil dreams. `dus' is an upasarga. `svapna' is derived from the root svap - Sayane - to sleep; the word `svapna' means `dream'. `nASana' is derived from the root naS - adarSane - to be lost, to perish. dushTaH svapno dus-svapnaH; dus-svapnasya nASano dus-svapna-nASanaH - He Who removes bad or inauspicious dreams. "Those who hear the story of gajendra mosham will be relieved of inauspicious dreams". SrI baladeva vidyA bhUshaN gives the same interpretation, and gives the reference quoted above as well. "O parIkshit mahArajan! I (Sage Suka) have narrated to you this great mahimA of Lord kRshNa that is called gajendra moksham, by hearing which all sins accrued in the kali yaga will be destroyed, bad dreams will be eliminated, and one can attain the svarga loka and all fame". SrI Sa'nkara interprets the nAma as the "Dispeller of bad dreams that forewarn of upcoming dangers, when He is meditated upon, praised and worshipped". SrI rAdhAkRshNa SAstri comments that since bhagavAn ensures that His devotees are not exposed to dangers, they do not get bad dreams forewarning them of the dangers also. He also comments that the habit of constant meditation of bhagavAn's nAma-s will ensure that in the long run, there is no room for bad dreams. SrI cinmayAnanda interprets that the worst dream is that of being re-born. He notes that when one is ever centered in nArAyaNa-smaraNa, then his sub-conscious mind is not loaded with half-digested thoughts and unexpressed intentions, repressed desires and suppressed motives, immoral passions and covetous inclinations, and he has no fearful dreams in his sleep. Over time he enters nArAyaNa-consciousness, and there is no room for bad dreams. 927. vIra-hA - He Who destroyed the powerful bonds that tied gajendra to death. We studied this nAma previously in Sloka-s 18 and 79 (nAma-s 168 and 747). Please refer to the write-up for nAma 747 in Slokam 79. 928. rakshaNaH - The Savior. The nAma is derived from the root raksha - pAlane - to protect. rakshati = pAlayati sakalam viSvam iti rakshaNaH. BhagavAn saved the elephant by touching it, embracing it, and speaking words of consolation to the elephant. SrI Sa'nkara explains the nAma as "One Who has the function of protection of all the three worlds"
- sattvam guNam adhishThAya jagat- trayam rakshan iti rakshaNaH - He who, assuming the sattva guNa, protects allt he three worlds. 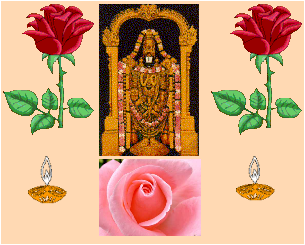 In tiruvAimozhi, nammAzhvAr stresses that it is Lord vishNu's nature to protect (kAkkum iyalvinan - pASuram 2.2.9). In fact, AzhvAr points out that in addition to protection, Lord vishNu performs the functions of destruction and creation through rudra and brahmA respectively by being their antaryAmi-s, and these functions are also directed in effect, towards protection of the jIva-s. The destruction is for the purpose of giving new bodies to the jIva-s instead of continuing with the aged and worn-out bodies, and the creation is to give indriya-s etc. to the jIva-s so that they can strive to attain Him in the new birth. Thus rakshaNam is the motivation for all His acts. "For the protection of the good, the destruction of the wicked, and the establishment of righteousness, Itake different incarnations in each yuga". Note that `protection' comes first in the reasons for His incarnations. In fact, destruction of the wicked is only for the protection of the good. 929. santaH - a) He Who makes those who have sought refuge in Him prosper. b) He Who exists for His devotees. c) He Who bestows the desired benefits on His devotees. d) He Who manifests Himself in the form of holy men. e) He Who is present everywhere and permeates everything. f) He Who is worshipped. g) He Who expands the world in a controlled way. sam- is an upasarga (preposition). The root for the nAma is tanu - vistAre - to spread. The word also means `to bestow, to lengthen' etc. (SrI Apte's dictionary). a) SrI BhaTTar explains the nAma as "ASritAn santanoti (samyak tanoti) iti santaH" - He Who makes those who have sought refuge in Him prosper, and feel joy by thoughts on Him. SrI baladeva vidyA bhUshaN gives the same interpretation - evam gajendram SaraNAgatam santanoti iti santaH. SrI veLukkuDi kRshNan explains the significance of the nAma as illustrating the guNa of bhagavAn in growing the confidence in us (santanoti) that He will protect us without fail. The very sight of bhagavAn during His procession around our streets is for giving us this confidence at the sight of Him. c) Or, tebhyaH ishTam dattavAn iti santaH - He Who bestows the desired benefits on His devotees is santaH. d) SrI Sa'nkara gives the following interpretation: `san-mAraga- vartinaH santaH, tad-rUpeNa vidyA vinaya vRddhaye sa eva vartata iti santaH" - Those who follow the right path (of dharma) are holy men. Since bhagavAn manifests Himself in the form of the holy men for the increase of knowledge and modesty, He is called santaH. e) SrI satya sandha tIrtha gives the derivation for the nAma as `sampUrvAt tanoteH DaH vyAptaH' - He who is present everywhere and permeates everything. This is consistent with the meaning tanu - vistAre - to spread. f) SrI kRshNa datta bhAradvAj uses the root san- sambhaktau - to worship, and gives the interpretation - sanyate ArAdhyate sma iti santaH - He Who is worshipped, is santaH. g) SrI vAsishTha explains the nAma as "samyak tanoti vistArayati jagat iti santaH" - He Who appropriately (in a controlled way?) expands the world, is santaH. 930. jIvanaH - The Life-Giver. The root from which the nAma is derived is "jIv - prANa dhAraNe - to live". SrI vAsishTha explains the nAma as "jIvayati = prANayati jIvana upayoga sAdhanaiH iti jIvanaH" - He Who sustains life by giving all the means for all the created beings to live. "One Whose nature it is to protect" - kAkkum iyalvinan kaNNa perumAn (tiruvAi. 2.2.9). All acts of bhagavAn are directed towards protection of the jIva-s. His swallowing the whole Universe with all beings at the time of pralaya, is only for the purpose of protecting them and giving them new bodies in the next cycle of creation. When a being meets with `death', it is only a means of removing the old, aged body, and giving the jIva a new body. Thus, bhagavAn is Life-giver in is acts of creation, protection and destruction. "The foremost among gandharva-s, Hoohoo by name, had become a crocodile by the curse of Sage devala. Later, when the crocodile met its death at the hands of kRshNa, he went back to svarga". Even though all we superficially note is that bhagavAn slew the crocodile, in fact He restored his life as a gandharva. Whatever bhagavAn does, including the slaying of the rAkshasa-s in His different incarnations, is truly for the benefit of the rAkshasa-s who are killed by Him. grAhamapi gandharvatbvena jIvati iti jIvanaH. "uyir aLippAn" - "Life Giver" (pASuram 1). He Who sustains all life forms by giving them vital airs (prANa), is jIvanaH. SrI cinmayAnanda explains the nAma as "One Who is the Life-spark in all living creatures". "Permeating the earth I support all beings by My energy; and having become the juicy Moon I nourish all herbs". 931. paryavasthitaH - He Who stands beside. SrI vAsishTha indicates the base root for the nAma as sthA - gati nivRttau - to stand, to wait, to be at hand, etc. pari is a prefix which means `round, round about' etc. prItimAn puNDarIkAksaH SaraNAgata vatsalaH - vishNu dharma. SrI v.v. rAmAnujan refers us to nammAzhvAr who points to this guNa of bhagavAn in his tiruvAimozhi - avA aRac cUzh ari (10.10.1) - nArAyaNa, who mingles with a yearning with His devotees, and also in pASuram 8.3.6 - tiru nIla maNiyAr mEniyODu en manam Suzha varuvArE - BhagavAn, with His cool bluish gem-like hue, comes to His devotees and completely occupies their mind. In the whole of tiruvAimozhi 1.9, AzhvAr describes how bhagavAn enjoys His devotee and pervades him and floods him gradually, and how all the indriya-s of the devotee are ultimately permeated by Him without interruption, and dedicated to His thought permanently. SrI kRshNan's anubhavam is that bhagavAn went round and round gajendra, to find out all the places where he might have suffered injury in his encounter with the crocodile, so that He can comfort the elephant as needed, and so He is called paryavasthitaH. vAtsalya bhareNa gajendrasya paritaH sthitatvAt paryavasthitaH. "BhagavAn, with angry red eyes, bore the gadA in His hand, and was moving around like a wind in all directions around the yet-to-be-born child, whirling the gadA in His hand that was shining like a burning firewood, and destroying the tejas of the brahmAstram with His gadA like the Sun that removes the dew. The child wondered aloud who this purusha was, who had suddenly appeared by his side". partiaH sarvato viSvam vyApya avasthita iti paryavasthitaH. antarbahiSca tat- sarvam vyApya nArAyaNaH sthitaH - BhagavAn is permeating all things inside and out. The act of permeation of bhagavAn as our antaryAmi in all of us, is a result of His concern for the jIva-s, to ensure that He is always with the jIva to help him in whatever he undertakes. paritaH = sarvata UrdhvAt adhaH, tiryak ca avasthitaH - sarva-vyApaka iti paryavasthitaH.